Still the same high-performing Continuous Glucose Monitoring system, now with Share technology (Bluetooth) built into the Receiver for remote glucose monitoring! Only Dexcom CGM keeps you One Step Ahead of diabetes by unveiling dynamic glucose patterns that no meter can. 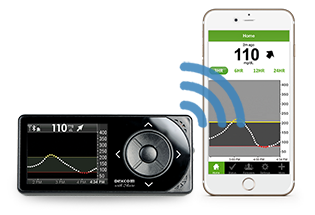 When it comes to glucose sensing, Dexcom sets the standard. Our outstanding accuracy, along with exceptional sensing performance, results in a reliable CGM you can trust. The Dexcom G4 PLATINUM Receiver with Share has Bluetooth wireless communication built in! Through secure wireless connections, the Dexcom G4 PLATINUM Receiver with Share allows remote viewing of glucose levels, trends and data between the person with diabetes and their spouse, grandparent or other loved ones from an Apple iPhone® or iPod touch®. The Diabetes Education Network is pleased to offer the Dexcom Continuous Glucose Management system. Contact us today at 702-9310 for a consultation. The all-new Dexcom G4® PLATINUM System with Share features BLE (Bluetooth Low Energy) wireless communication built into the receiver, enabling remote monitoring capabilities. Through secure wireless connections, the Dexcom G4® PLATINUM Receiver with Share allows remote viewing of glucose levels, trends and data between the person with diabetes and their parent, spouse, grandparent or other loved ones from an Apple iPhone® or iPod touch®. Sharing is caring, so whether you’re in college, you live in another state, or you’re going on a business trip, the Dexcom G4® PLATINUM System with Share is there to keep you and your loved ones connected and informed. How does the Dexcom G4® PLATINUM Receiver with Share work? CGM data is sent from your G4® Platinum Receiver with Share to your compatible device. Your compatible device sends your glucose information to the Cloud via Bluetooth. The Cloud sends Dexcom CGM data to up to 5 Followers’ compatible device. A compatible device with an internet connection. Now compatible with both Apple and Android devices! Dexcom is proud to announce compatibility with the Apple Watch, offering you yet another option for connectivity and convenience. By utilizing your Dexcom G4® PLATINUM System with Share™ and a compatible mobile device, you’ll be able to see your glucose information data in real-time on the Apple Watch.